The Department of Architecture prides itself on providing an accessible and intellectually rigorous exploration of design. The department emphasizes a creative and collaborative approach that is spirited, socially progressive, and environmentally responsive. Students are encouraged to follow their passion in whatever direction it takes them. 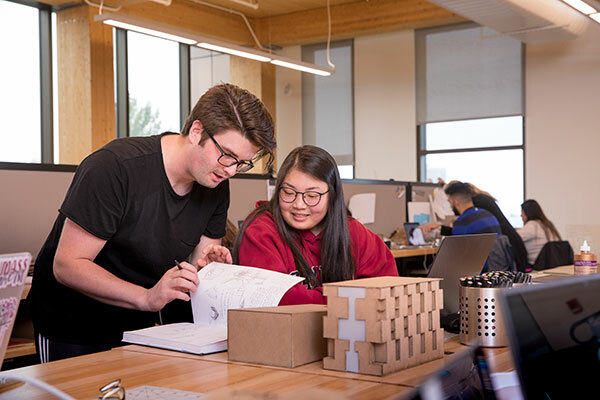 The architecture department’s courses and internships fuse originality and inspiration with technical expertise and formal innovation, giving our majors the tools they need to succeed. The graduate program offers degrees in Architecture, Historic Preservation, Landscape Architecture, and Regional Architecture. Our interdisciplinary, collaborative department embraces spirited, socially progressive, and environmentally responsive design. As New England’s first public architecture program, the faculty and students engage the region for integrated teaching, research, and outreach.